April brings wisteria, azaleas and a bevy of other blossoms – including Southern belles! 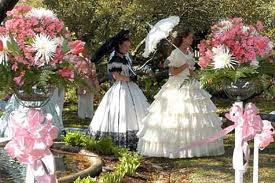 Since its inception in 1948, the Azalea Festival has blossomed into an extended weekend celebration that attracts more than 300,000 people. For more than 50 years, the folks of Southeastern North Carolina have been throwing the best party in the South and you’re invited! There’s something for everyone among our community’s rich array of artwork, gardens, history and culture. This entry was posted in Family Friendly, Local Sights, Music Events, Spring Event, Spring Events, Wilmington by admin. Bookmark the permalink.